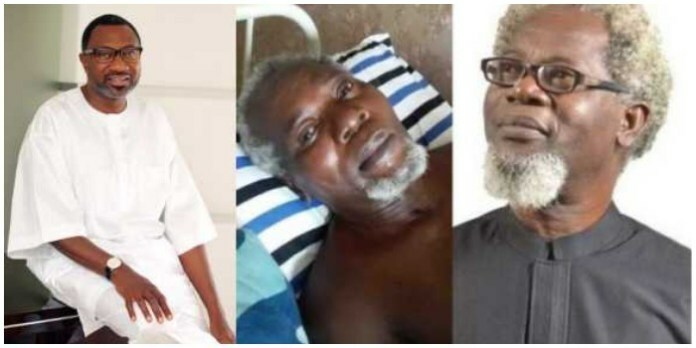 Its time to rejoice for ailing veteran Nollywood actor, Victor Olaotan as help just came his way through Oil mogul businessman, Femi Otedola, who reportedly volunteered to cater for all his medical bills. Before now, calls had gone to the public few days ago about the likeable actor’s deteriorating health and the need to help him get back on his feet again and soon. To that end, a Gofundme page was created by one Emmanuel Ajibade which went live on Sunday 2nd December, appealing for financial aid to seek medical treatment abroad for the actor abroad. To carry out the treatment, the actor reportedly needs the sum of $50,000. This, and more, Otedola was reported to be ready to provide ‘once talks with the bedridden actor’s wife and family members are concluded’, noted a source. A source said that Victor’s appeal with Otedola was championed by fellow actor, Richard Mofe-Damijo, who is a friend to the Lagos born business mogul. Victor Toye Olaotan has brought Joy to teeming viewers on stage, television and the big screen through his solid work as a professional actor. For the last two years he has been incapacitated following an accident which occurred at Apple junction, Amuwo Odofin along Mile 2 expressway around 4 am on the 31st of October 2016 on his way to a movie location.